Posted in: Lego News, Lego Sales, Official Sets. Tagged: Iron Man, LEGO, Lego Shop At Home, Marvel, Marvel Super Heroes, Polybag. Begining today, LEGO is giving away the Iron Man vs Fighting Drone Set pictured below with any purchase over $50 when you shop online or instore. So it’s a rather bland giveaway, and If your an Iron man collector, you likely already have this version of Iron man. If you don’t and you still want it, or you’re a Poly bag collector this might be the time to buy. otherwise this set is a pass. Posted in: Instructions, LEGO Video Games. Tagged: Instructions, Iron Man, Iron Man 3, LEGO, Marvel, Marvel Super Heroes. So you’ve Pre-ordered the Lego marvel Super heroes, and bought a couple Iron Man sets, now you’ve got a few different Armors, but what to do with them? Click through to the Lego Club Home Page to download the complete instructions and parts list. Posted in: Lego News, LEGO Video Games. Tagged: Iron Man, Iron Man 3, Iron patriot, LEGO, Marvel, Marvel Super Heroes. back in January we posted the news about the upcomming LEGO Marvel Super Heroes game, now the news is circulating, about the pre-order exclusive minifig you can get with the game, when you buy pre-order through Walmart. This is not your average fig either, it’s the IRON Patriot. Is It on your must have list as well? Posted in: Lego News, Official Sets, Uncategorized. Tagged: Hawkeye, Iron Man, LEGO, Lego Super Heroes, Loki, Magneto. Deadpool, Marvel Super Heroes, Movie Poster, Shop at Home, The Avengers, The Hulk, Thor, ULUG, Utah, Wolverine, X-Men. 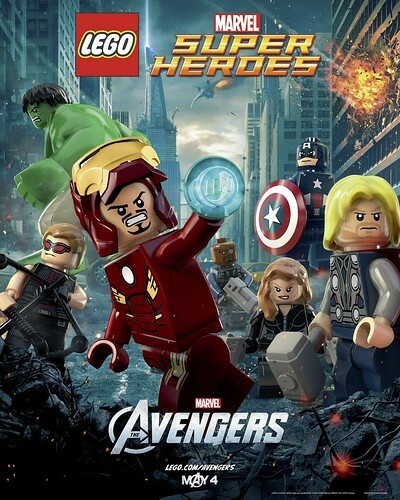 In related News, Lego and Disney (the owners of marvel comics) have announced that they will be giving away 2 million copies of the LEGO Avengers Movie Poster on opening day. Just another reason to get out to the movie in May. If however you are unable to make it on opening day, you can click through the image and print out your own low-res copy.